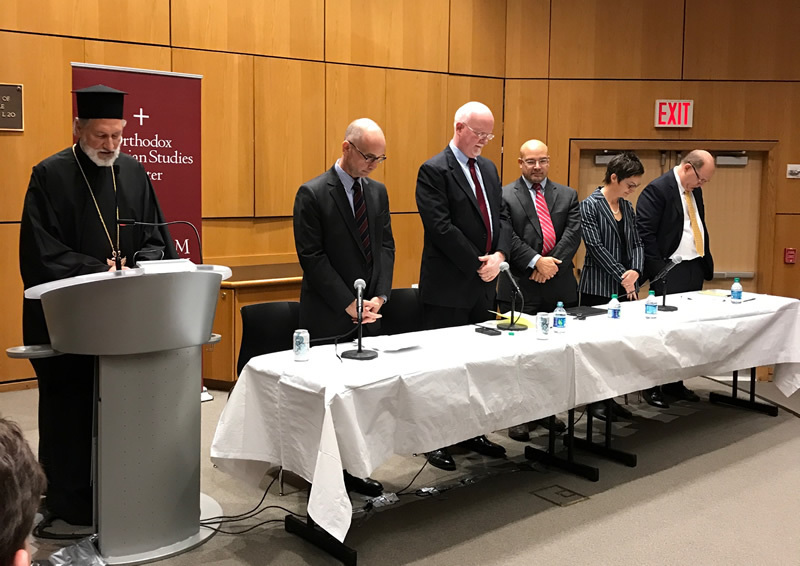 On Wednesday, November 1, 2017 at the Fordham University Lincoln Center Campus in New York City, the Orthodox Christian Studies Center sponsored a panel discussion on “Trump, Putin, and Traditional Values”, featuring Mark Movsesian (moderator), St. John's University Law School; Shaun Casey, Georgetown University, former head of Religion and Global Affairs Office of US State Department; Nikolas Gvosdev, United States Naval Academy; Kristina Stoeckl, University of Innsbruck; and Peter Wehner, Ethics and Public Policy Center, former White House staff under Presidents Reagan, Bush Sr., and Bush Jr.
His Grace Bishop Irinej of the Serbian Orthodox Diocese of Eastern America opened the evening with prayer. The expert panel reviewed American Evangelical and Russian Orthodox personalities who are forming alliances to support “traditional values” against "political liberalism," and each for their own purposes: American Evangelicals are attempting to influence the political and cultural landscape of the US; while the Russian Orthodox are looking to forge a new East-West alliance. This panel session explored the political, social, and religious dimensions of this new alliance and its geo-political implications. The Orthodox Christian Studies Center of Fordham University in New York City, under the leadership of professors Aristotle Papanikolaou and George Demacopoulos, connects an archipelago of cultures, religious traditions, and academic disciplines to advance awareness and knowledge of Orthodox Christianity in public discourse.